This article by A J Theolade appeared in T&T’s Guardian. Here’s an excerpt focusing on Derek Walcott. Follow the link below for the complete report. Most cities have museums where the country’s national artefacts are put on displays. Some museums are internationally famous like the British Museum in London where visitors can see King Tut tomb, Moma in New York, known for its quirky exhibitions or the Louvre in Paris where thousands flock every day to see La Joconde, better known as the Mona Lisa. Museum Day was on May 18 and the International Council of Museums (Icom) and 30,000 museums in 120 countries, including T&T, devoted a month to celebrating museums and their role in society. In T&T, five of the country’s more popular museums saw an increase in footfall as the Ministry of National Diversity and Social Integration encouraged the public to visit the National Museum and Art Gallery of T&T in Port-of-Spain, Angostura Museum and Barcant Butterfly Collection in Laventille, Central Bank Museum in Port-of-Spain, UWI’s Zoology Museum on their St Augustine Campus and the Tobago Museum located at Fort King George, Scarborough Hill, Tobago. Anna Walcott-Hardy, daughter of Nobel laureate Derek Walcott says that her family was also inspired to share their collection, which includes paintings by her grandfather Warwick Walcott, sketches by Derek Walcott and the work of local artists like Jackie Hinkson, Boscoe Holder and Cindy Arthur. “Our art is as good as anything else,” says Walcott-Hardy, “we are among the most creative people in the world.” Describing her childhood home as a place “with art, where everyone was painting,” Walcott-Hardy who studied art history, geography and literature at Boston University says that while she doesn’t consider herself widely travelled, her visits to museums in places like London, New York, Madrid and Barcelona have helped to reinforce her love of art. Making her own case for the use of new technologies, Walcott-Hardy says that she visited the museum with her daughter and they were able to do their own tour with an iPod. “We could that here,” she says plaintively. She also encourages that films and books be considered great receptacles of history. 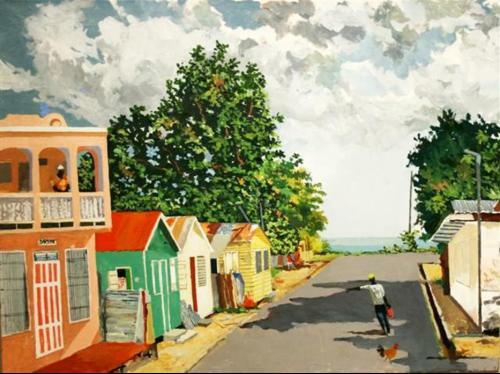 Image: Watercolor painting by Derek Walcott.